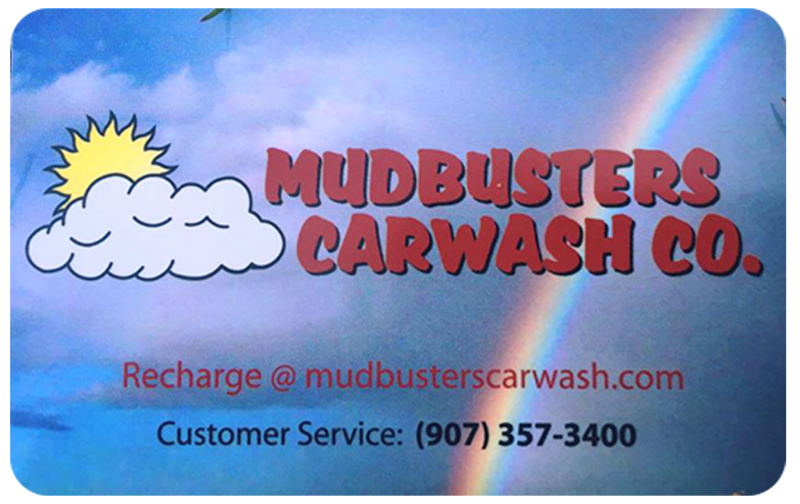 Value Card | Mudbusters Carwash Co.
Mudbusters Car Washes, automatic’s, self-serve bays, and dog wash, accept customer Value Cards and Credit Cards, right in the bay! WHAT IS A VALUE CARD? Value Cards are similar to gift cards, and allow the user to wash with just a card swipe at the meter. Buying a Value Card can save you money. A purchase or recharge over $100. adds an additional 10% bonus value to your card. Using the Value Card also allows you to get a receipt for your purchase or to view Value Card usage using the on-line “Virtual Storefront”. HOW DO I GET ONE? Cards can be purchased on-line or through our attendants. Cards can also be recharged at any of these locations. Prepaid accounts allow you to have multiple cards drawing from one prepaid balance. Contact us to assign multiple cards to one draw from one balance. ON-LINE: REGISTER YOUR CARD: The remaining value on unregistered cards cannot be recovered if lost or stolen. Registering your card allows you to check your balance, add value to your card on-line, or bring up reports of card usage. ON-LINE: BUY OR ADD CARDS: you can buy cards directly from the Virtual Storefront or add cards to your multi-card account. These cards can be picked up onsite or mailed to you. ON-LINE: MANAGE YOUR ACCOUNT: By logging in to your account you can manage values and card usage of our various account types. Value can be added to prepaid accounts. USING YOUR VALUE CARD: The Value Card is similar to a debit card. At the dog wash or self-serve bay, after verification of a valid card, the meter “TIMER” light will turn on and you are ready to select any function and begin washing. The card reader display will show the amount charged to the card in .25c increments. When you are finished washing, press the red “STOP” button. At the automatic wash, swipe card and select wash. Push the red “REFUND” button for receipt and card balance. Any lost or stolen cards should be reported to Mudbusters Car Wash Co. immediately. These may also be deactivated in your on-line account.